Wallerian Degeneration - Is Axonal Degeneration without local Inflammation and before local DeMyelination that results from a distal injury to the same Axon. Wallerian Degeneration commonly occurs, sometime after a distant Axonal part has been severed. White Matter - The common term for Myelin and/or the Medullary Body and consists of: Myelinated Axons, and supporting cells (Astrocytes). The Medullary Body is the Cerebrum's deep interior (includes the Corpus Callosum, surrounds the Basal Ganglia, and parts of the Ventricles). 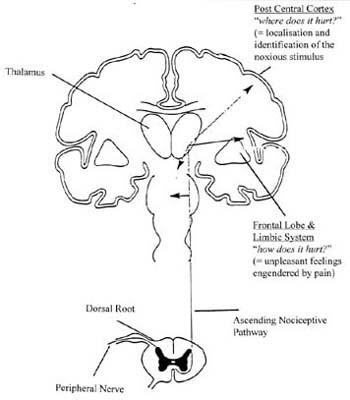 - Various other Nerve Pathways (ie; Cerebral Peduncles, CorticoSpinal Tract, and Medial Fasciculus Longitudinal) interconnect the entire Brain to the Spinal Cord). This is still very much a work in progress, so please overlook the construction mess and drop me a line or two. I'll probably always be adding on new information, sites, and thoughts.